The Sagittarius New Moon always brings a renewed bright energy to the winter season. It is the last fire sign of the zodiac, stoking the fires until Spring. This time we land on the Wolf Moon cycle... a cycle of activation, raw energy, and highlighting the natural world around us. The Wolf Moon cycle is ignited by Sagittarius and Aries, both fire signs during the waxing, or growing, phase of the moon cycle, and moves into the watery realm of Cancer for the Full Moon. We then move into the Airy sign of Libra for the Last Quarter moon of the cycle. Earth energy comes in on December 21st, when Sun enters Capricorn shifting our focuses to responsibility, ambition, and long term plans and goals. This is a wonderful time to reflect on 2017 and make plans for 2018. Create a word of the year for 2018! Overall, the Elements are pretty well balanced this moon cycle. The double dose of fire lends some much needed energy to us, while earthy Capricorn continues to sustain us. Mercury goes direct on December 23rd, so communications and your mind, will be less cloudy and gain more clarity! 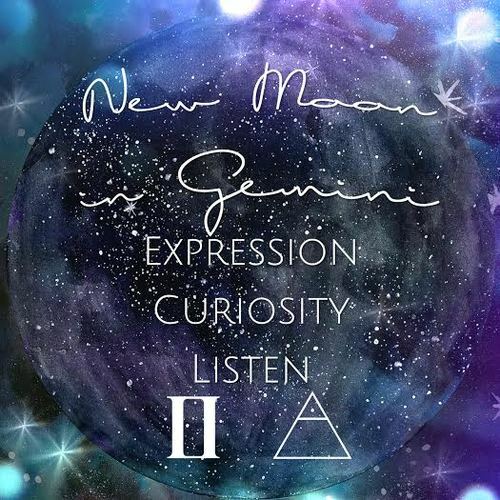 Cancer is at home in the Full Moon, so intuition and emotions will be high! The 2018 Tune to the Moon Planner is available! Purchase the planner or join the sistarhood! We are SO excited to introduce a new offering that is very near and dear to our hearts! We have created the Tune to the Moon Sistarhood and 2018 Moonthly Planner! If you join the Sistarhood we will send you the Moonthly Tune to the Moon Printable Planners for each moon cycle of 2018! You will also have a spot in our private community of healers, mystics, artists, and dreamers! You can also buy the entire planner separately! A Sagittarius New Moon highlights adventure, trying something new, and shifting to a new outlook or perspective. The Card pulled is the Lunar Eclipse: Sovereignty. You are being asked to step into your power. There is also larger energy at play with the shifting of power in the world. What does it mean to be whole unto yourself? How would this impact your life and the next year ahead? Aim your bow high and and set standards higher for your quality of life! Work with the energies of Sunstone and Moonstone to balance and merge the masculine and feminine within yourself. You will feel ready for this new voyage and grounded in your intuition! When Aries is in the First Quarter Moon, the energy is high! You may feel the pull to go, go, go, or your temper may get the best of you. 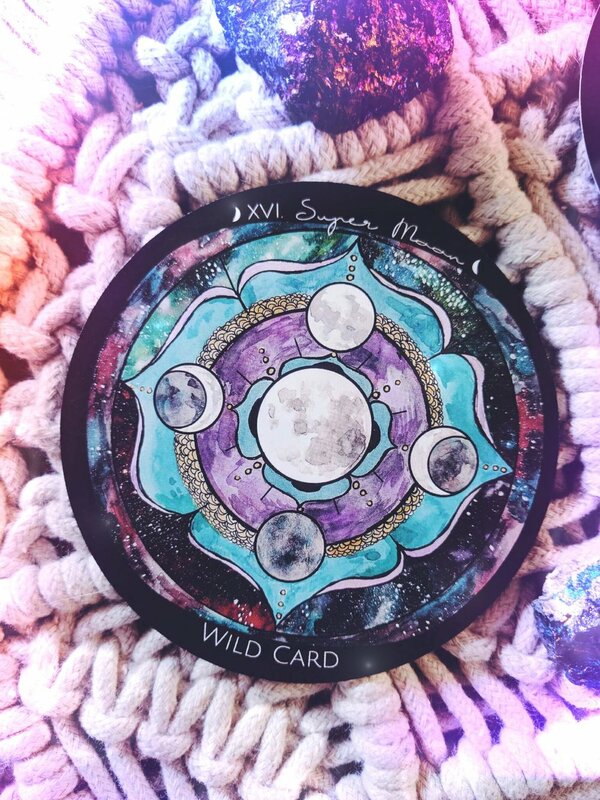 The card pulled for this phase is the Super Moon: The Wild Card! Anything can happen today! So it is important to take a step back and see what elements are running rampant around you. Is Fire energy all consuming? Use Aquamarine to soothe any tempers and impatience. Is your mind (the Air element) on the fritz? Amethyst will calm any anxieties and boost your creativity. Are you emotions flowing everywhere? Black Tourmaline can ground and protect your energy, while Citrine can lighten your spirits. Is you body feeling sluggish? Red Jasper can gently ground and stimulate your Root chakra, or a good workout session might be in order. The point is to tend to your elemental bodies when the Super Moon card is pulled. The elemtns are highlighted and energy can be chaotic. Focusing on balance and nourishment is key to moving through this energy. Cancer is ruled by the Moon in astrology, so this Full Moon will feel extra cozy and lovely to kick off 2018. The card pulled is The Waning Crescent: Support. Cancer rules the hearth and home, while the Sun in Capricorn highlights family, tradition, and responsibility. Stay close to your family and tribe at this time. There may be a family member who needs you support right now, but is too afraid to ask or is too prideful (Capricorn energy can do this). Do not be afraid to reach out and show your love through action. If you need help with something, simply ask and let yourself receive this help and love. Blue Lace Agate can help you lovingly communicate with your family, while Amazonite strengthens bonds. 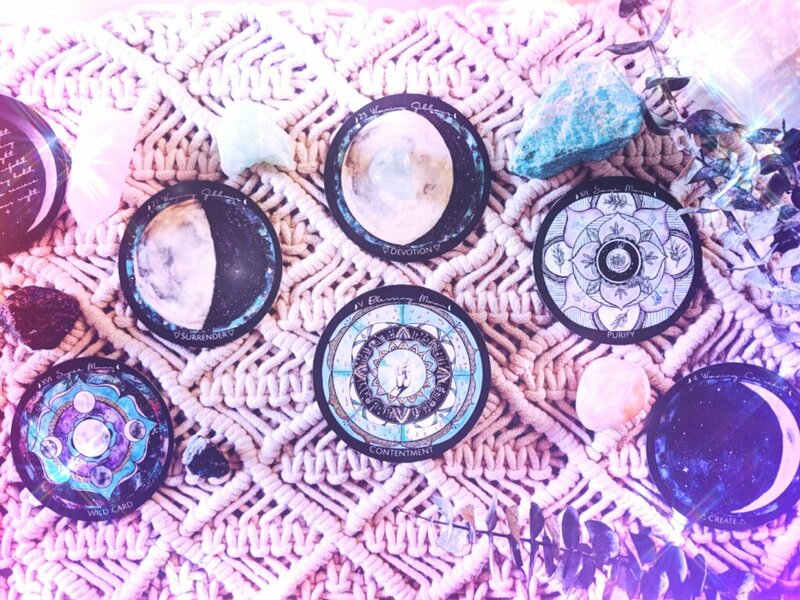 During any quarter moon it is always a good time to check in and restore balance. 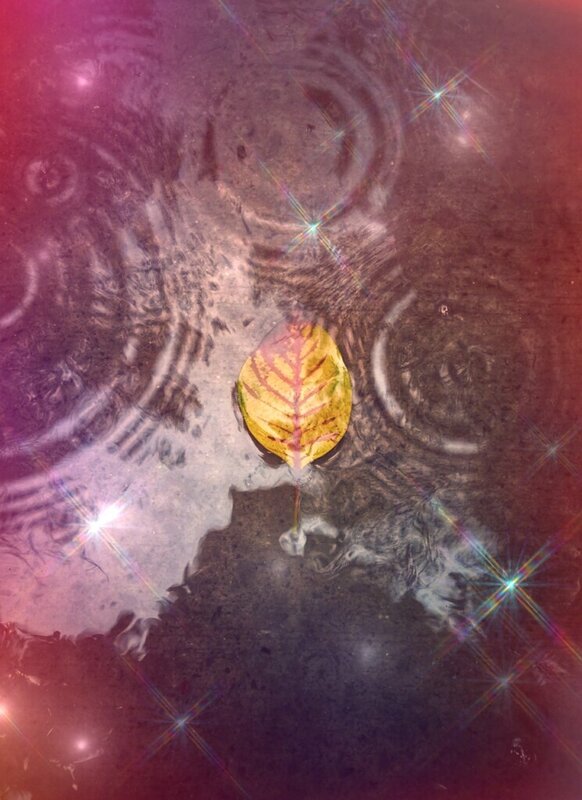 On the First Quarter we tended to the elemental realms, and now with a Libra Last Quarter moon check in with your heart. Libra rules relationships, so ask yourself have you been cultivating them? Including your relationship with yourself? Is there a balance of giving and receiving? The card pulled is Gemini: The Twins... pulling a zodiac card can indicate a person in your life. Is there a Gemini in your life that you want to get closer with, or you need to have a discussion with? Now is the time. In Tarot, Gemini is the sign of the Lover's card, indicating a merging of two energies... masculine/feminine, light/shadow... what is merging within you? Work with Rose Quartz to open your heart and balance the energy of giving and receiving within. The key to this cycle is BALANCE. 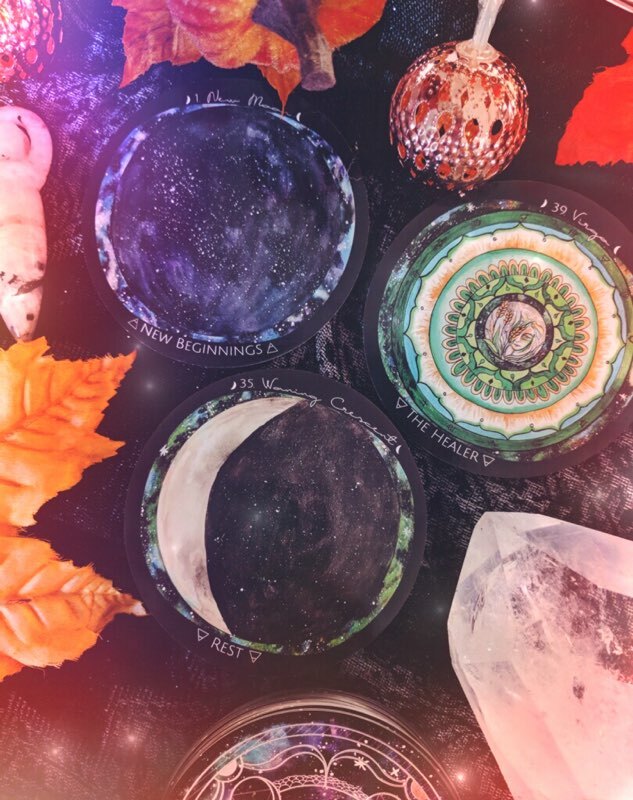 Trust your intuition, listen to your instincts, and connect with each of your elemental realms. You will feel a shift in energy and feel balanced for the new year ahead. Now is a great time to try the Wolf Moon reading from the Spirit de la Lune Guidebook! Please share your readings with us! We are also going to be releasing our 2018 Calendars this month! Be sure to be signed up for our newsletter for the release date. Or sign up for the Sistarhood for exclusive discounts!